I didn't binge; but like I wrote yesterday, I was just lacking all sorts of motivation this week. Eating, running, blogging, all of it. I only got in my step goal five times (and there wasn't a good reason to not get in the steps on the other two days); I only wrote a couple of blog posts, mainly because nothing was happening and I just didn't feel like writing; I didn't try any new recipes; and my eating was totally out of the norm (again, for no real reason). Sometimes, I'll have a bad run for no particular reason; so I think maybe this is similar, in that I just had a bad week in general. After my 10K was over, I felt an enormous sense of relief. I had set a near-impossible goal and I reached it--yay! But it took a huge toll on me mentally. I was so completely focused on that goal that when it was over, I felt kind of lost. I think that contributed to the lack of motivation I felt all week. Without a big goal in front of me, I just didn't really feel the drive to continue what I'd been doing. In Seattle, I did the cupcake crawl with Laurel, and I absolutely loved that. When I got home, however, I thought I'd better try to cut back on the sugar because I'd eaten so much sugar in Seattle. I *knew* that "cutting back" was a mistake, but I still did it. Whenever I try to cut back on or cut out anything at all, it either makes me binge or I lose control somewhere else. I managed not to binge (barely), but this week was the most difficult week I've had, and I certainly strayed from my normal eating patterns. When I saw the gain on the scale last week, I wasn't bothered in the slightest--I'd gone on a very fun vacation, and it was worth a 3.2-pound gain on the scale. But again, I decided I should try to cut back in order to take that weight back off, and it messed with my head. The lesson I learned this week is that I need to just keep doing what I was doing all along, and my weight will adjust and fall where it wants to. The most important thing to me is to keep peace with food, and I didn't have that this past week. Instead, I felt stressed about food. This coming week, I am not even going to worry about losing any weight (I'm still 5 pounds under my goal weight anyway); instead, I'm going to focus on getting back to that peaceful place with food. Eating whatever I want, not trying to cut back on anything, and maintaining balance. For 36 weeks, I wasn't worried about food at all, and I felt good about it; then this past week, it was like I turned into the "old me" on Weight Watchers, trying to make up for the gain on the scale, and allowing it to stress me out. I'm going to think about it some more, and put together a plan this week--regardless of what I decide for my next big goal. I just want a new focus to keep me motivated! I always love the honesty in your posts Katie! I am sure you will find a new goal soon. I also like the idea of a biking goal! The biking idea is a good one. Why not see if there are any "charity rides" in your area? They are always a fun time. They even have shorter rides for the kids. There are all levels of competition there as well. Check out duathalons...biking and running! I was thinking about that while I was writing this post, actually! ;) Unfortunately, I didn't even feel determined all week. It was just a very "blah" week for me for some reason. But I am very determined not to gain back all the weight I just lost in the fall, so that will keep me going! I just did a century and I can recommend them! There are metric centuries too (100 km/65 miles) which might also suit your purposes. It's a lot of training time, but it might be a nice break from running. There are a bunch of plans out there to get you up to century distance, and 30 miles is a good base in that regard, imo. I was thinking about that today--I don't think I'd want to find an actual organized century ride, but I'd rather just do it by myself. I hate riding on the roads, so I think I'd map out a 100-mile bike path route. I'm certainly not going to break any time records! haha, but I think just riding that distance would be a fun goal/accomplishment. I've been looking at some training plans online, and it certainly would be a big time commitment. We'll see :) Thanks for the input! Having done a few centuries myself, I definitely recommend doing an organized century rather than just mapping out your own. Mostly due to the support. You need a lot of food/water/possibly mechanical support over 100 miles and the aid stations are crucial. Secondly because making your own route is logistically challenging due to road safety (and nice scenery!) and an organized ride will take care of that for you. Just my two cents! It's also really fun doing an organized ride because of the camaraderie of the group. I have done a breast cancer ride twice, it's called Tour De Pink, and it holds a special place in my heart. It's in California, three days, 220 official miles, but day two there is an option to do a century. You ride 60-70 miles in a day, and you pull into the hotel each evening and your bags are there. It's awesome. And it's a great cause, support for young women with breast cancer. I can't make it this year, but my goal is 2017 and to ride the whole thing and include the century. They have a SAG, that will pick you up if you need to rest, I rode as much as I could then SAG'd to the next rest stop. Erin, that sounds amazing! That is definitely something that would interest me. I can't plan any more trips this year, but I will definitely keep it in mind for next year! Hey Katie! Always love your honesty...I get the same way after a huge goal accomplishment, you use feel stagnant for a while. I know you said you aren't into Triathalons but have you thought about doing a Duathlon? It's a run/bike/run...we have them down here in Florida and they are lots of fun to mix it up so you aren't just running, you don't have to go super long distances, and most are on closed roadways. Fair warning....cycling can sometimes flare the sciatic, but overall doing more than just running always gets me in even better shape than running alone. Best of luck finding that next goal! That's actually really common in people who are just starting out with the low heart rate training! Yes, you basically just do whatever it takes to keep your heart rate under the prescribed bpm--even if it means walking. You should see improvement, and after several weeks, be able to run the whole thing (ever so slowly!). If you haven't already, I would read about the MAF training on Dr. Phil Maffetone's website. He explains it really well! OMG has your post today helped me tremendously! I am 9 lbs under my WW goal and 2 lbs under my own goal. My weight has been bouncing back and forth 129-132. But I am still in this "weight loss" mind frame. Even though I am still part of WW I went back to counting calories for maintenance because its less stressful. I have to stop worrying about losing weight now. I really have to stop it. I need to focus on something else and make new goals. So for the first time since i had hip surgery at the end of 2014 I made an easy 10k training plan and going to focus on toning up. We really should throw away our scales. :) Love ya chicka! I'm glad that you're doing so well with maintenance! You've kept the weight off for a long time now. It's certainly hard to get out of the "weight loss" mindset. Once I hit my goal weight, I didn't do anything differently, because the way I've been eating for the past nine months is the way I want to eat forever (eating what I enjoy without bingeing). My weight continued to drop, without my trying to lose--something that had never happened before! I think that because we have focused on the weight loss for so long, it's kind of ingrained in our minds. I think it's awesome you're going to train for a 10K! How do you get back into that motivated state of mind when things have been less than perfect? I think that's my biggest hurdle. I'm super motivated for a chunk of time, then "reward" myself and end up losing all motivation for weeks or months at a time and mess up all of my hard work and have to start the cycle all over again...I guess that's why they call it yo-yoing. I just want to get to a normal, happy place with food but it seems impossible. Do you have any tricks up your sleeve for getting back on the horse, so to speak? That's a good question, and I really don't have the answer! 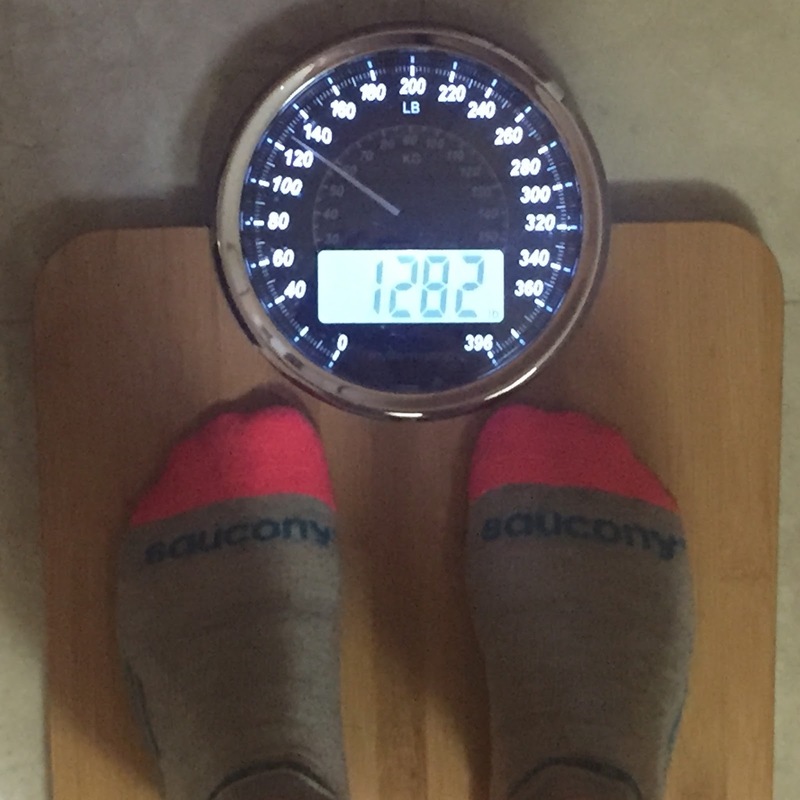 Right now, I keep thinking about how hard I worked in the fall to drop the weight, and through the winter to get faster at running--and I would hate to lose all that hard work. So, I'm consciously thinking of that when I make food choices. I think a big problem is when we try to overcompensate for a bad meal, or day, or week. That always leads to yo-yoing (for me, anyway). Instead, it helps to go right back to being on plan. For example, after a binge, instead of cutting calories back to 1,000 or 1,200 for a few days to "make up for" the binge, I would just go back to the 1,800-2,000 that was working well before the binge. Does that make sense? Your honesty is humbling. Thanks for sharing. It seems I'm not the only one you helped out with your post. As others have mentioned, riding might be a good goal. it might be fun to attach a trip at the end of the amount of miles you bike. If you bike 1500 miles at summer's end, maybe you can take a trip that's 1500 miles away from your home? I completely relate and am glad to know I'm not alone! It happens with every race, and even now I've been in an exercise "rut" for several weeks after my big PR. It even happened after my wedding because it was so much planning and mental stress (I felt lost for weeks!). Let me know how you internally pull yourself back into a routine. I've definitely learned not to schedule too many races too close together because I can never guarantee that I'll turn around and be up to training for the next one. I admire your determination though! Cheers! That's exactly what I was thinking! My immediate reaction was to want to choose another race, but I know that will lead to burnout. So I need to pick a different goal to work on. I really don't want to get burnt out on the training! Hey Katie! I have a question, something I've been wondering for a little while now. Why are you still trying to lose weight while you are in the 120's if your goal weight is 133? If 133 is your goal, then shouldn't you be striving to reach that? But you seem to be striving for something a bit lower than that... so clearly your goal is something else. It seems contradictory. I wasn't trying to lose weight beyond 133. I continued to increase my calories little by little for maintenance, but the weight continued to come off until I was at 123. I like having a cushion under my goal weight so that when I splurge (like on vacation) I don't have to fight so hard to stay at my goal weight. A lot of people have a goal weight range rather than a specific number for this reason. I think 133 isn't really your goal weight but more of a red flag number now. At least that's how it comes across. I don't think a 10lbs cushion is necessary when one doesn't overeat or binge. If 133 is truly your goal wouldn't a range of 130-136 work? It just seems like being/staying in the 120ies costs you a lot of effort and I feel bad just reading about it. You seemed so much happier when you were maintaining on WW. Yes, I'm aware that a lot of people have a weight range rather than a specific number. For me, my "goal weight" is 175 and my range is 179-172. Anything within that 7 pound swing is fine, I only see 179 following a vacation, and 172 when my appetite lessens for whatever reason. However, if my weight inexplicably dipped into the low 160's I would have to really reassess things. If I felt that was unhealthy for me I would make an effort to gain back the lost pounds to get back into my range. If I happened to like being in the 160s then I'd readjust my "goal", say to 165 and then adjust my range to 162-169. But if I worked to stay in the 160s, and got to 167 and said I wanted to lose a few pounds I couldn't then also say that my goal was still 175. That wouldn't make sense. It must work and make sense for her ( and me too) . Everyone is different. Wouldn't "being at goal" mean that you can actually maintain your weight (within a small range) without losing and gaining the same 10 lbs over and over again? As an ex jojo dieter I find this message really dangerous, weird and it sounds mentally stressful. To each their own but I find showcasing that one needs a 10 lbs cushion is just wrong. Just commit that you want to be in the low 120ies. All good. It's a good thing we all don't have to live our lives the way others think we should. Hi Katie! I love this post because it shows how well you know yourself! I totally understand how the "cutting back" after your vacation could lead to an off week because that is what happens to me every time too (even if it's just "no sugar at night" or something that seems totally reasonable. I just always fight against ANY food rule for whatever reason!). I am just SO impressed that you didn't binge and that you figured out what was going on so you could work through it. That's really amazing and encouraging! You have all the right tools and the right attitude. Someday I would like to have a healthy attitude about food, but first I have to hit my goal weight. A century ride would be awesome! You got this Katie! Katie-- Thanks for the post-- It was spot on for me this week too! I have been following (first time commenter). You have really inspired me to with your words about food and associations. I have been writing down everything I am eating for about 8 weeks and have lost 10lbs. I am trying not to stress about eating certain things but keeping it under 2000 calories a day and keeping my movement around 8K steps a day. I still have a ways to go but feel good that after 43 years I might just be changing that relationship with food! Thanks for writing! Katie! Again another honest and awesome post. I identify with so much of what you write. I hope you're just having an off week and next week is much better. As always, I am inspired by you! I just love your honesty Katie and I appreciate your dedication to writing these posts. You being honest makes you real to me. YOU are a rock star! I love this post! You are so courageous in writing about your experience and it is so helpful to all of us facing our own obstacles. Katie, thank you so much for recommending the calories counting application (myfitenesspal). I am using the application for 35 days an already lost 2.5 kg. Now I am at the lowest weight as far as I remember myself:) Thank you again!